Shaw talks at a TTA camp this summer.Â His kids are dedicatedÂ TTA campers when he is in the Bay Area. There is a closet inside Brian Shaw’s bedroom that takes him back to a time he wishes would stand still. He finds himself inside the small room every summer in late June, on the floor, touching the remnants of a past he can’t let go. He unzips a garment bag, takes out a shirt his father wore to work, his mother’s favorite coat, his sister’s jumpsuit. He hugs the clothes, brings them up to his face and close to his chest as if he were still hugging and kissing those who once wore them. This wasn’t how Shaw was supposed to celebrate birthdays, anniversaries and championships, alone, surrounded by old clothes and fading memories. Reliving the horrible night of June 26, 1993. Brian Shaw has always been there. He was with the Boston Celtics in Larry Bird’s final days with the team. He was with the Golden State Warriors when Latrell Sprewell choked P.J. Carlesimo. He hit a then-NBA record 10 3-pointers with the Miami Heat. He was there to put his arm around Allen Iverson during one of Iverson’s first run-ins with Larry Brown in Philadelphia. And he was there to lob alley-oops to Shaquille O’Neal with the Orlando Magic and later the Los Angeles Lakers en route to four trips to the NBA Finals and three titles. Even now, after spending five years as Phil Jackson’s right-hand man and expected successor, he stands to inherit a playoff-contending team if, as many believe, he is chosen to replace Jackson and make his head-coaching debut with the Lakers next season. He has been, admittedly and unexpectedly, lucky. But none of it will ever make up for the night he wasn’t there. Shaw can still picture them on that June day, loading up the Jeep Grand Cherokee he had bought his dad three years earlier for Father’s Day. Shaw was 27 and had just finished his fifth season in the NBA but was an unabashed mama’s boy when he returned home. In the offseason, he lived in the guest bedroom of a house he had bought in Oakland, Calif., for his parents and his sister. Shaw replays the decisions in his head to this day. Why didn’t he just trade in the Jeep? Why didn’t he just buy them plane tickets? Why did he have to buy them another house in Las Vegas? Nothing made him happier than watching football with his father, eating his mother’s gumbo, playing cards with his sister and, his newest favorite pastime, jingling his keys in front of his sister’s 11-month-old daughter, Brianna, as she took a couple of steps toward him before falling into his arms. Brianna, whom his sister named after Brian before she was born, was the apple of her uncle’s eye from the moment he first held her in the hospital. It was Shaw’s goal to have his parents retire early once he made it as an NBA player. In the fall of 1992, he bought some property in Las Vegas and built a second home for his family. Shaw was planning to trade in the car he’d given his father and get him a new one for Father’s Day. His mother insisted he keep the old one and buy a new one when they returned from their trip, saying it would be better if they drove to Las Vegas and kept the car there to use when they flew in. “I beat myself up with that,” Shaw said. “If I would have just gone and traded that car in like I wanted to, they would have flown down there. They wouldn’t have been in the car that night driving there. If I wouldn’t have had bought the house down there in Vegas, they wouldn’t have had any reason to be driving down there. He was an imposing figure: 6-foot-2, 285 pounds, with a heart to match his frame. On weekends he would load the neighborhood kids into the back of his pickup truck and go to basketball games and on fishing trips. Charles Shaw was a mechanic for the U.S. Postal Service. His wife, Barbara, whom he’d met at a party in Oakland when they were both college students, worked in child development. Every summer the Shaw family — including Brian, who was born in March 1966, and Monica, born in June 1969 — traveled to Barbara’s hometown in Guyana in South America to visit her brothers and sisters and their children. They would travel with suitcases filled with clothes that they would empty along the way, spurred by Barbara to donate their belongings to those who needed them. They often would return home with nothing. Brian’s earliest memories of basketball always include his dad. When Charles would come home, tired from a long day of working on cars, he would grab a beer, sit outside and watch his son play basketball in the driveway. He would coach him from his courtside seat, telling him to use the backboard on his shot or to get lower when he was dribbling the ball. The sound of his father’s voice as he played basketball became soothing when he would get on the court. Charles and Barbara went to as many of Brian’s games growing up as they could, following him from Saint Mary’s in Moraga, Calif., to UC Santa Barbara. Always within driving distance. They flew to Boston and Miami during his first four years in the NBA, and made five trips to Italy when Brian played for Il Messaggero Roma for a season during a contract dispute with the Celtics. The plan was for Charles, Barbara, Monica and Brianna to leave for Las Vegas by 6 p.m., but Charles didn’t get back from work until 9. It was Friday night and he was tired, but his working days would soon be over, and the family was eager to get to Las Vegas by Saturday morning. Monica would be celebrating her 24th birthday that weekend. Brian was staying behind to host a party with his girfriend Nikki, who is now his wife, but planned to fly into Vegas to meet with them Sunday. 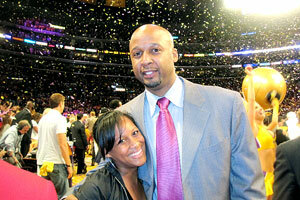 When the phone rang at 8:30 the next morning, Brian Shaw got up slowly, looked at the clock and answered the phone. It was about a 10-hour drive from Oakland to Las Vegas, and Shaw was certain he would hear his father’s voice on the other end of the line. “It was the coroner’s office saying they had gotten into a car accident,” Shaw said, still struggling with the words nearly 18 years later. According to reports, the Nevada Highway Patrol would conclude that Charles, 52, fell asleep at the wheel at about 5:15 a.m. on Interstate 15, just 9 miles from Las Vegas. The car hit the center divider and rolled, ejecting Charles; Barbara, 51; Monica, 24; and Brianna. Barbara and Monica died at the scene of the accident. Charles died from his injuries about an hour later at University Medical Center in Las Vegas. Brianna, who was riding in a child-restraint seat, survived, but was hospitalized with a ruptured spleen and facial lacerations. Shaw was with Nikki when he got the call. The next 72 hours were a blur. He was raw, stunned and confused. Shaw got on the earliest flight he could find to Las Vegas and immediately drove to the hospital. As soon as he saw Brianna, injured but alive, he was handed forms to sign for her temporary custody. It would be the first of many surreal obligations Shaw had to take care of as his life was flipped upside down. He went to the accident site before going to the wrecking yard where the car was, and finally to the funeral home where the bodies of his father, mother and sister were. He made arrangements to send them back to Oakland for their funerals. 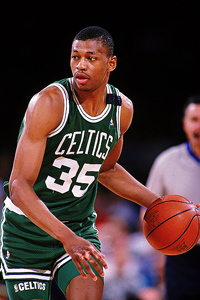 Tim Defrisco/Getty ImagesReggie Lewis, a former Celtics teammate of Brian Shaw’s, was one of the first people to call Shaw after the accident. One of the first calls Shaw got after the accident was from Reggie Lewis. Shaw and Lewis had become close during Shaw’s three seasons with the Celtics. Only four months separated the two youngest players on the veteran Celtics team that featured Larry Bird, Kevin McHale, Robert Parish, Dennis Johnson and Danny Ainge. 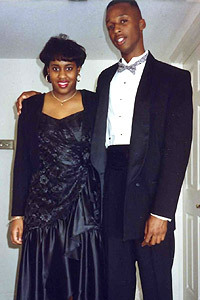 Lewis and his wife, Donna, had just had their first child, Reggie Jr., and Donna was five months pregnant with their second when they flew to Oakland to be with Shaw for the funeral. Reggie and Donna stayed a few extra days as Reggie talked Brian through his grief. Before Lewis flew back to Baltimore, they made plans to meet again the next month in Boston. Lewis and Shaw kept in touch on the phone leading up to Lewis’ planned operation and Shaw’s scheduled trip to Boston. The last time they talked, on July 27, 1993, Lewis told Shaw he was looking to buy a new house and was about to go sweep up the driveway before going to shoot around at a nearby college. Lewis went into cardiac arrest while shooting at Brandeis University in Boston. Two hours later, he was pronounced dead at Waltham-Weston Hospital. Shaw flew to Baltimore for his friend’s funeral three weeks after Lewis had stood beside him at the funeral of his mother, father and sister. “It was hard to go through that again and see what his wife and family were going through right after what had happened to me,” said Shaw, who makes it a point to look up at Lewis’ No. 35 before every game at the Garden in Boston. Courtesy of the Shaw familyBrian Shaw and his sister, Monica, had always been close, but his support during her pregnancy inspired her to name her daughter after him. Brian Shaw has an impeccable memory. His wife begrudgingly admits he never forgets anything. His former coaches and teammates can’t recall ever having to repeat instructions to him. His friends are still surprised when he remembers their birthdays or a passing exchange from years ago. But for the past 18 years, his memory has been healing and haunting, constantly reminding him of those he loved and suddenly lost. Toward the end of the summer Shaw wishes he could forget, he went though his family’s drawers and closets for clothes he could give to those in need. It was something his mother would have wanted him to do after all those summers of giving the clothes off their backs in Guyana. As he went through their belongings, his senses were sent into overdrive. His mind flashed back to events he experienced with them in each outfit as their smells filled the air. Nikki Shaw has come to expect summers to be particularly hard, especially in late June. She knows there will be a day that month when Brian will take out the bag he keeps his mother’s jewelry in and lay the pieces across the bed, touching each one as if he’s taking an accounting of them. Shaw doesn’t wear any jewelry outside of his wedding ring and a diamond earring in his left ear, made from one of his mother’s rings. “I wanted to keep her with me in some kind of way,” he said. When Shaw closes his eyes to picture his family, he remembers Thanksgivings and Christmases, the trips to see friends and family, and the hundreds of basketball gyms and arenas they traveled to over the years. But he cannot help his mind from drifting back to the night he lost them all. The accident site, the car with the compressed roof and the images of the bodies he had to identify. Courtesy of the Shaw familyBrian Shaw’s niece, Brianna, will be 19 in July. Brianna is a living, breathing example of just how long it actually has been. She was 11 months old when the child-restraint seat saved her life. She will be 19 in July and heading to college this fall. Brian Shaw remembers the day his sister came to him in tears after she found out she was pregnant with the child of a former boyfriend. She was afraid to tell her parents. Brian and Monica were already close, but Brian’s support during her pregnancy inspired her to name her daughter after him. Shaw remembers that when Brianna walked for the first time at 10 months old, it was toward him. He jingled his keys in front of her as she stood, leaning against the coffee table until one day she took five steps toward him before falling down, laughing and clapping at what she had just done. After the accident and an ensuing custody battle with Brianna’s biological father, Brianna lived with Shaw’s aunt in Oakland. Shaw, who was granted custody but played for the Miami Heat and later the Orlando Magic, flew from Florida to Oakland every couple of months until he was traded to the Golden State Warriors in late 1997. Shaw said he did his best to make sure Brianna was raised in an environment that was as normal as possible. He was hesitant to have Brianna call his aunt “Mommy” and him “Daddy,” but he also didn’t know how to tell her she was wrong. Children, however, aren’t as tactful. Brianna later told Shaw what she had heard. He had asked child psychologists about the best time to broach the topic of the accident with Brianna, and they all said he would know when the time was right. This was earlier than he had hoped, but he had no choice. It wasn’t until Brianna was 12 and began looking and sounding like her mother, causing others to tell her about the striking resemblance, that she began asking Brian about Monica and looking at old pictures and videos. It was Barbara Shaw’s dream to have Brian play for the Lakers. He smiled as he recently sat in the middle of the Lakers’ practice court, in his 12th season with the team as a player, coach or scout, and remembered the draft day party at his parents’ house in June 1988. Shaw had just averaged 13.3 points and 8.7 rebounds per game in his senior season at UC Santa Barbara and led the Gauchos to their first NCAA tournament berth. He’d had private workouts and impressed the Lakers’ front office of Jerry West, Mitch Kupchak and Ronnie Lester, and was confident they would select him with the last pick in the first round of the draft if he were still available. On draft day, as he was surrounded by his family and friends toward the end of the first round, he prepared to put on a Lakers hat. Shaw played for seven teams in 10 years before coming back to L.A. He had been cut after a trade from Portland to Houston, he was turning 33 and he had played in only 21 games the previous two seasons. He asked his agent to reach out to the Lakers’ front office of West, Kupchak and Lester, the same trio who had hoped to draft Shaw 11 years earlier. He was invited to the team’s minicamp, where he reteamed with four former teammates — Shaquille O’Neal (Magic), Rick Fox (Celtics), Glen Rice (Heat) and John Salley (Heat) — in a pickup game. Shaw fit in seamlessly. He connected with O’Neal for a couple of alley-oops and found Rice in transition for some open 3-pointers. 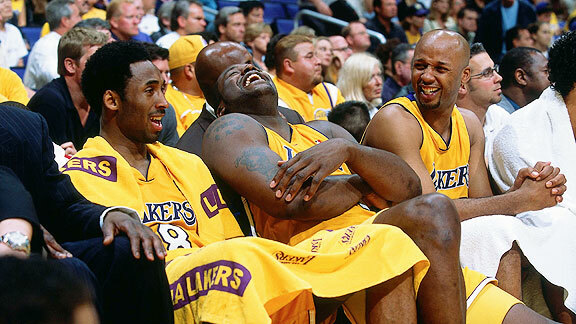 But the Lakers didn’t have room for Shaw on their roster. He flew back to Oakland and the uncertainty of retirement. But Kobe Bryant broke his right hand in the Lakers’ first exhibition game, prompting Phil Jackson to ask Shaw to return to the team. Shaw shook his head at the irony as he boarded a plane back to L.A. Bryant would be out for eight weeks, and by the time he was healthy to return, Shaw had become too valuable to release. His three crucial 3-pointers in Game 7 of the 2000 Western Conference finals resurrected a team down 13 in the fourth quarter, but he also was a leader in the locker room, mediating disagreements between Bryant and O’Neal even after he retired in 2003. Shaw began training to be a coach during his last two years with the Lakers, helping with scouting reports and breaking down film. After Shaw spent a year scouting for the Lakers, Frank Hamblen, who stepped in as head coach after Rudy Tomjanovich resigned during the 2004-2005 season, hired him as an assistant. Shaw remained an assistant after Jackson returned to the Lakers and sat next to Jackson on the bench for the past five years. After Jackson announced this would be his final season coaching the Lakers, Shaw was instantly tabbed as the favorite to win the job. He has the support of Bryant, Derek Fisher and Hamblen, who has helped train Shaw for the opportunity. Two hours before a Lakers game at Staples Center in early April, Brian Shaw sat on the Lakers’ bench watching his son, Brian Jr., 12, and daughter, Bianca, 10, shoot around. He gave them occasional pointers, like his father had done for him in the driveway. There are moments when Shaw can see his parents’ qualities in them. It won’t happen this year, but on June nights in the past, when the Lakers have celebrated championships, Shaw has looked around a jubilant, champagne-soaked locker room, watching players embrace their parents and siblings. “When all the celebration and stuff is going on, I sit to the side and reflect,” Shaw said. “When I see everyone else’s parents there, I picture in my mind what my parents and my sister would have been doing if they were in there as well.